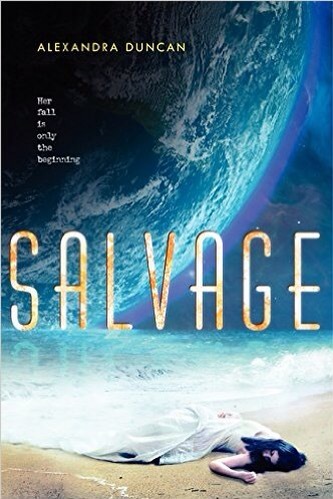 Thank you to Houghton Mifflin Harcourt for granting me a review copy via Netgalley. Although this is sponsored all ideas are my own. Also, sorry for the inactivity! (haven’t posted in 3 months…oops…) We still won’t be very active on here but I’ll try to post some of my Netgalley reviews. And, my computer wasn’t letting me do paragraph breaks so this is really cringe-worthy. Although the book’s synopsis promised more than the contents, the book was overall decent. The cover’s light colors and nice looking font made it seem like this would be a light and peaceful read. But instead, this book about a sister mourning the loss of her brother was way darker than I expected. It was actually kind of uncomfortable for the reader. At least for me haha. I just thought it was written in sort of a weird style that was hard for me to connect with, and that combined with the dark events that were happening made it really awkward to read… That’s my main complaint for the whole book actually. Anyway, now that that’s out of the way, I can talk about something else (another complaint sorry!) I know it seems like I hated this book, but it was solid! I didn’t like how the characters barely changed. I probably stand alone with this opinion, but when I looked back I felt like the characters had remained exactly the same. The events of the book really did not have any effect on them. Sure, the characters were well developed, but it kind of got thrown out the window when they stayed the same through the entire book. But the writing style was really unique as was the entire book. I did think it was “good” but it wasn’t really my style. Well first of all, thank you so much to Random House for sending me a review copy! Second, this book wasn’t really my thing but I ended up liking it! Ok, thank-yous and disclaimers aside, let’s start! When I read the premise I was so so confused. 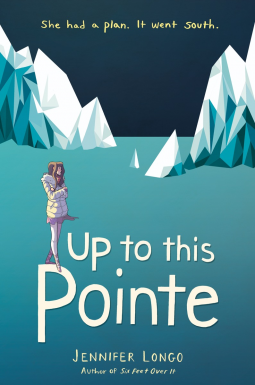 A book about ballet… and best friends… and somehow Antarctica gets thrown into the mix, too? What? But the author integrated them really well, with the occasional overlap of events since the book switches between two locations/time periods. It’s a sweet contemporary about finding yourself, and I think it’d appeal to a lot of readers but the cover doesn’t do it any justice (which is probably why I was originally turned off by it.) Don’t get me wrong, it’s very well-drawn and designed, I recognized Noelle Stevenson’s work right away! I just think the cover sort of makes it look like it’s aiming for a more juvenile audience but it was more of a classic YA plot with some additions. So, what’s it about? (I have some serious explaining to do what with the Antarctica subplot I mentioned earlier.) Our heroine Harper has been a ballerina all her life, along with her BFF Kate. They’ve sworn to a specific plan that involves them becoming professional ballerinas together at the San Francisco Ballet. But then Harper impulsively boards an Antarctica-bound airplane, following in the scientist footsteps of her relatives. I’ve been watching too much of The Office lately, if you can’t tell. Anyway, this was a great and truly original book. If your reading style is anything like mine you’ll probably be saying, “Eh. Doesn’t intrigue me.” Well you should give it a try in January. Thanks for reading this.. whatever this is. Jumbled up mess of random opinions that I can’t seem to put into a coherent sentence. It’s that time of year again! Time to cozy up by the fire and curl up with a good book. Yes, that, but for me it’s the time where the summer/fall releases come off the library waiting list and into my hands. Wolf by Wolf is one of those, and it was worth the wait! It’s set in the 1950s and is about teenage spy Yael who needs to get closer to Hitler in order to annihilate him. The way to do that is to take the place of motorcycle racer Adele Wolf, win the race, and kill Hitler at the Victors’ Ball. Was that too much for you? Yeah, maybe in the hands of any other writer, but Ms. Graudin executes it perfectly. Lots of stuff going on, yet she makes it intriguing and really engrossing without being chaotic. The historical context and the constant drama of both Yael’s and Adele’s lives made something real and gritty. The writing was very interesting and engaging. 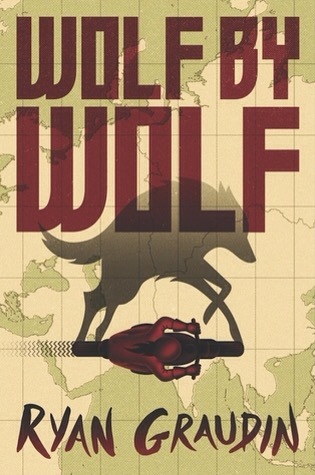 I enjoyed The Walled City, but I enjoyed Wolf by Wolf even more. Again, it’s rare nowadays to find a YA author that gets better over the course of many books. I was always on the edge of my seat and didn’t hit sluggish spots. The writing style was unique, with glimpses into Yael’s own head. I’m ready for a sequel and any other book Ms. Graudin writes! Yael is a bit of an unreliable narrator, which I liked. She’s tough, smart, and skilled. Readers will be rooting for her as she’s up against the most impossible situations, which is crucial in a book like this. You can connect to the cast of supporting characters, but the one thing that really bugged me was Luka. He was so cruel to Yael and she kept crawling right back to him. Ok! 5/5. I would recommend this to you if you like historical fiction or action/adventure. Hello everyone! Now that it’s Thanksgiving break we will be more active on the blog. For our American friends, we wish you a very happy Thanksgiving. While we wait for that delicious day, why not try out a meme? This is our original meme, if you want to do it please do so but give credit to us! 🙂 Happy Turkey Day! What are you thankful for? TURKEY: A book that everyone loves that isn’t all that special. E: I don’t get why everyone loves To All The Boys I’d Loved Before by Jenny Han. I mean, it was decent, but cookie-cutter. E: A Song For Ella Grey by David Almond. It was really unique and I’ve honestly never read anything like it. J: All the Light We Cannot See by Anthony Doerr!! E: Over the summer I read an ARC for When Starts Collide by Shirl Rickman, which was great, but the book itself was, um, really not for me. E: My pick–cover your ears– is unfortunately Veronica Roth’s Insurgent. *screams ensue* I know, I know, but I couldn’t get through it. I was satisfied with Divergent’s ending. J: P.S. I Still Love You. You can read my review, I express how much I do not feel the need for it there. Are they dead? Are they alive? Or are they… SCHROEDINGER’S BLOG? In all seriousness, I am really sorry about the inactivity lately, and I know J is, too. We’ve both been really busy with school, and sometimes it seems like we’re drowning in homework, instead of books, as it should be. I’m happy to report that Thanksgiving break (gobble gobble) is coming up, so there’ll definitely be new reviews up then. Okey smokey, let’s get on with the review! The book is about high school best friends Dave and Julia and their list of Nevers– cliché high school things that they’re never, ever going to do. In their last few months of senior year, Julia suggests breaking all the Nevers. While doing so, they realize that by trying so hard not to be cliche, they were missing out on high school. The plot took your everyday “best friends high school romance” and put a great twist on it, making something fresh and fun. Some scenes were– dare I say it– cliche, but intentionally so. The characters. They were kind of average. Dave was a little bit flat, and Julia was sometimes very 3D and spontaneous, but sometimes whiny, annoying, and clingy. The character that I liked the most was Gretchen, complex and sweet. The characters did have well-developed and strong emotional connections, which is what made some scenes painful and feels-worthy. Also, my complaint here is that everyone switched too fast from love interest to love interest. <3? </3? Whaaaat. And there you have it! 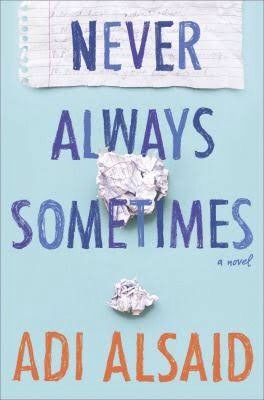 Never Always Sometimes was overall engrossing, with some minor issues here and there. I would recommend this to fans of realistic fiction and romance, and, uh, how do I put it: “school stories”? Like the ones where teenagers navigate love? (???) Good enough. 😉 4.5/5 stars. So, this book… I don’t really know what didn’t work. I think it’s because I felt like it was trying too hard to follow YA trends and to appeal to teens. This is one of those books that has their own secret language that is never explained at all, so be warned! Don’t you just hate it when books do that? And the names, God they were terrible. It’s like, whose first name is 5 words long? Ugh. I think this book had a lot of potential but the author played it too safe. I say, taking just a little more risks and being original could’ve done wonders for the book. But it did have some cool feminist, sci-if kind of elements going on, but unfortunately those weren’t really explored much. Anyway, if like me you’re psyched for this book, I honestly wouldn’t recommend it, as terrible as it sounds. I might read the sequel though, just to see if it gets any better. This was an epic fantasy book with a lot of stuff going on. It’s a little bit of an add-on to Ms. Rowell’s Fangirl, so if you’ve read that then know that this is the fanfiction that Cath writes. It’s about a magical boarding school where children learn to become wizards and witches…oh, wait. Hm, we’ve read that, haven’t we? Yes, the mirroring of our dear Harry Potter and his years at Hogwarts were intentional, but sometimes they just seemed like a bit much. Anyway, it’s about Simon Snow. And…now that I think of it, the plotline isn’t really clear. It’s more of a mash of events that don’t really connect. He is the Chosen One and he fights creatures? I know it sounds really lame but I can’t think of a clear storyline. As is expected of Ms. Rowell, the writing is quite enticing. But not as much as I had hoped. Some of it was just not exciting. I unfortunately found myself skimming. Some parts I was on the edge of my seat, the top of the roller coaster, and then the roller coaster took a spiraling plummet. The characters: I wasn’t too big a fan of either Simon or Baz, the two main characters. They weren’t very likeable, and they were both like, “We hate each other so much,” and then they were like, “Oh, we have such a great relationship.” Me: ??? Looking back on this review, it makes it seem like I hated this book. But I really didn’t, it’s just two things. One, I have read all of Rainbow Rowell’s other books and loved them all, and this one fell flat for me. Two, I’m really not a fantasy person. So all in all, this book just wasn’t for me. 3.5/5 stars.